November 03, 2010 (KATAKAMI / IsraelNationalNews.com) — A senior Al Qaeda leader was killed Wednesday in Gaza. A car bomb killed the terrorist and seriously injured his partner in an explosion outside the main police headquarters in Gaza City. Local Arabs said the man killed was a senior field commander in the “Army of Islam,” associated with Al Qaeda. 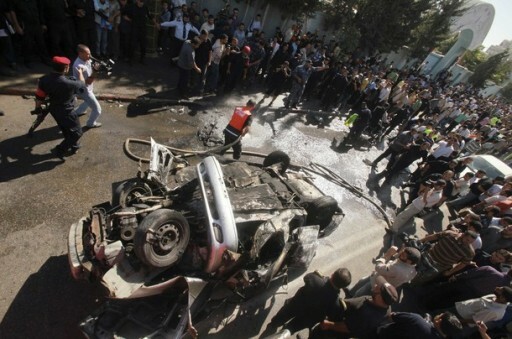 Hamas claimed that the car was bombed in an Israeli air attack. (KATAKAMI / CHARLOTTEOBSERVER.COM) PARIS French President Nicolas Sarkozy has convened an emergency government meeting to discuss security after an al-Qaida offshoot claimed to have killed a French hostage in Africa. The leader of al-Qaida’s North African branch said in a message broadcast Sunday that the 78-year-old French engineer was killed in retaliation for the killing of six al-Qaida members in a raid. That raid last week was led by Mauritanian forces aided by the French military. Humanitarian worker Michel Germaneau was abducted April 22 in Niger. Sarkozy’s office and other French officials would not confirm or comment on the audio message. But Sarkozy is meeting several of his Cabinet ministers Monday morning. A United Nations investigator called Wednesday for a halt to CIA-directed drone strikes on suspected Islamic militants, warning that killings ordered far from the battlefield could lead to a “Playstation” mentality. Philip Alston, U.N. special rapporteur on extrajudicial executions, said missile strikes could be justified only when it was impossible to capture insurgents alive instead and only if they were carried out by regular U.S. armed forces operating with proper oversight and respect for the rules of war. The Central Intelligence Agency’s use of unmanned Predator or Reaper drones in Afghanistan and Pakistan against al Qaeda and Taliban suspects had led to the death of “many hundreds,” including innocent civilians, he said in a 29-page report. “Intelligence agencies, which by definition are determined to remain unaccountable except to their own paymasters, have no place in running programs that kill people in other countries,” Alston said. The world does not know when and where the CIA is authorized to kill, its criteria for choosing targets, whether they are lawful killings, and how it follows up when civilians are illegally killed, said Alston, an independent expert who will present his report to the U.N. Human Rights Council Thursday. The CIA disputed the investigator’s conclusion. “Without discussing or confirming any specific action or program, this agency’s operations unfold within a framework of law and close government oversight. The accountability’s real, and it would be wrong for anyone to suggest otherwise,” a CIA spokesman said.The United States is among the Geneva forum’s 47 members. Under President Barack Obama, the CIA has stepped up its drone strikes in the tribal zone of Pakistan bordering Afghanistan, targeting not only high-level al Qaeda and Taliban targets but largely unknown foot soldiers as well. Following a directive first issued by former President George W. Bush and continued by Obama, the CIA has widened the “target set” for drone strikes in Pakistan, Reuters reported last month. Al Qaeda’s third-in-command, Sheikh Sa’id al-Masri, is believed to have been killed in May in a U.S. missile strike in Pakistan, U.S. officials said earlier this week. The United States is believed to control the fleet of drones from CIA headquarters in Virginia, coordinating with civilian pilots near hidden airfields in Afghanistan and Pakistan who fly the drones remotely, according to Alston, an Australian who teaches at New York University School of Law. “Because operators are based thousands of miles away from the battlefield, and undertake operations entirely through computer screens and remote audio-feed, there is a risk of developing a ‘Playstation’ mentality to killing,” he said, referring to the popular Sony video game console. Israel stands accused of ordering the killing of Mahmoud al-Mabhouh, a Hamas military commander, in a Dubai hotel room in January. Israel has neither confirmed nor denied a role in the murder. Alston said Russia was also suspected of conducting targeted killings in Chechnya and beyond the breakaway region as part of its counter-terrorism operations. The United States is among 40 countries with drone technology, according to Alston. Britain, China, France, India, Iran, Israel, Russia and Turkey are named as having or seeking the capacity to fire missiles from their drones. But countries should use graduated force and where possible capture suspects rather than kill them, he said. “Thus, rather than using drone strikes, U.S. forces should, wherever and whenever possible, conduct arrests or use less-than-lethal force to restrain,” he said. (Israelnationalnews.com) The United Nations has criticized the United States’ use of armed drones in an attack that killed the Number 3 commander in the international Al Qaeda terrorist organization. Philip Alston, the U.N. Special Representative on Extrajudicial Executions, called on the United States to limit its use of the technology outside the direct combat theaters in Afghanistan and Iraq. Sheikh Said Al-Masri was assassinated by a CIA-operated drone in a tribal area of Pakistan near the border of Afghanistan sometime last week. Alston issued a 29-page report warning that the growing use of the armed drones by the U.S. would result in “competing drone attacks” by dozens of countries against anyone “labeled as terrorists by one group or another.” According to the U.N. official himself, at least 40 other countries already have drone technology. The report was submitted to the U.N. Human Rights Council in Geneva, which the U.S. joined after President Barack Obama took office. The United States did not respond directly to the report, although a White House spokesman referred reporters to an earlier speech by State Department legal adviser Harold Koh. “A state that is engagement in an armed conflict or in legitimate self-defense is not required to provide targets with legal process before the state may use lethal force,” Koh said. But the United Nations has questioned the State Department’s definition of what a legitimate target might be, and rejected “pre-emptive self-defense” as a justification for killing terrorism suspects away from the direct combat theater.